A significant milestone in the development of marine renewable energy in the United States was passed yesterday as Ricardo completed administration, in support of the U.S. Department of Energy (DOE), of the Wave Energy Prize– a complex project aimed at sparking innovation in wave energy conversion technologies. The Wave Energy Prize has sparked the development of game-changing wave energy converter systems that have the potential to reduce the cost of wave energy, thus making it more competitive with traditional energy sources. The challenge started in late 2014 and included six months of planning plus 20 months of public activity, in a project lasting 26 months in total. 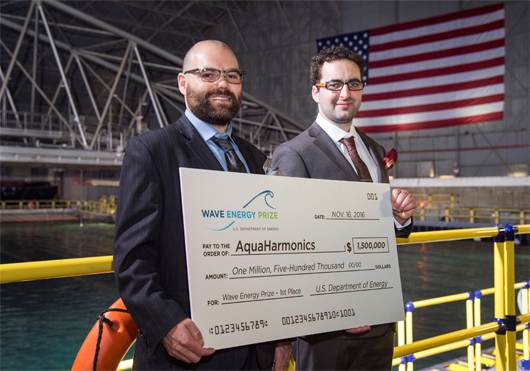 The DOE announced that AquaHarmonics has won the Wave Energy Prize – and has been awarded the $1.5 million grand prize. CalWave Power Technologies was awarded second place, along with the $500,000 cash prize, while Waveswing America came in third, and received the $250,000 cash prize. Renewable energy initiatives such as the Wave Energy Prize are a natural fit with Ricardo’s mission to advance technology that reduces CO2 emissions in order both to provide a more sustainable future while also helping to combat climate change. The company also has significant experience in the administration of complex, crowd-sourced innovation capture projects, making it an ideal partner for DOE on this project. Ninety-two teams registered for the prize beginning in April 2015. Of these, 66 turned in technical submissions that were evaluated by a panel of judges to identify 20 official Qualified Teams in August 2015. These teams completed small-scale (1/50th) model testing, numerical simulation and other tasks, which were evaluated by the judges to identify nine finalists and two alternates, which were announced on March 1. These teams received up to $125,000 in seed funding to build 1/20th-scale prototypes of their wave energy converter devices. The administration of this complex technical prize challenge was successfully executed via a multidisciplinary team with relevant technical depth and experience, including engineers from Ricardo’s Energy and Environment division who have extensive experience of designing and evaluating the performance of wave energy converter devices. The scope of work included project management, quality assurance and operations in phases of planning, build, test and evaluation, post-competition publicity and wrap-up. The Wave Energy Prize demonstrates Ricardo’s ability to manage government projects and coordinate sub-contractors, including the woman-owned small business JZ Consulting, that provided prize administration managing terms, rules and team interface, in addition to Polaris Strategic Communications, a service-disabled, veteran-owned small business, that managed the marketing and digital communications strategy.